Are you and your significant other ready to take your budgeting game to the next level? You’re both on board with the budget, you’ve made great progress on your financial goals, but there’s some room for improvement. These 10 best budgeting tips for couples are intended to help you see even more success with your budget! How can budgeting help couples? Budgeting helps couples communicate about where you are with your finances and where you want to be. You are making a plan or a path about how to get there. Being on the same page when it comes to finances creates a healthy budget as well as a stronger relationship. These budgeting tips for couples will help take your budgeting to the next level by focusing on current and future financial success. 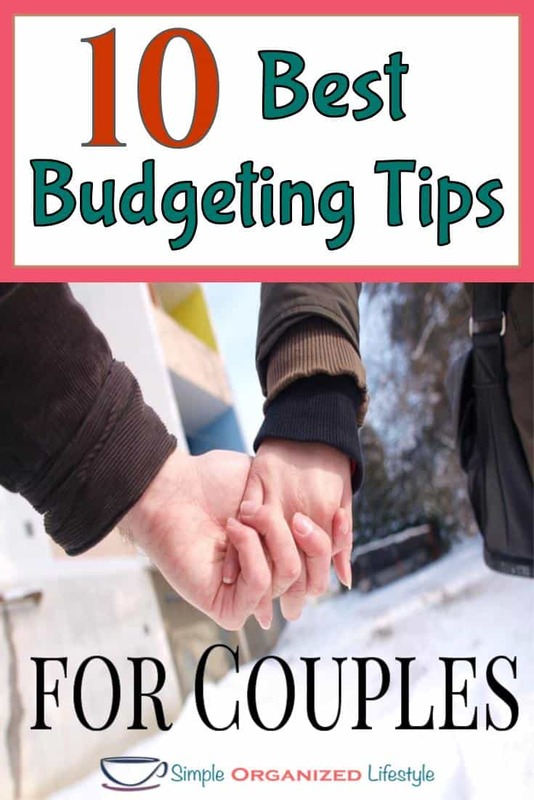 1- Have a regular budget meeting as a couple. In order to get on the same page when it comes to your finances, make time to talk. Make it a “money then movie” night at home and talk personal finance over popcorn! It doesn’t have to be something you dread. It’s a good time to come together as a team. If you need a tool as a starting place, I highly recommend this 90-Day Budget Workbook. It’s simple and effective for all things budgeting from figuring out your net worth to making a plan to pay off your debt. Each month, I’ll ask Mr. SimpOL about a good time to have a “state of the budget.” It’s not the most romantic thing to say, but we know it’s important and schedule a time . Ideally, we find a time when our child is visiting with a family member so that we’re less distracted. We regularly talk money around him, but this conversation is more focused on details and numbers… not ideal around a kid in the peak of the “why questions” phase! 2- Set a routine shopping schedule together. Your budget will get better with consistency from setting a routine shopping schedule. If you can shop at the same times and places as much as possible, it will help you plan your purchases and avoid impulse buying. For example, if y’all decide that Saturday is grocery store day, you can start a list early in the week and have it ready by the day you shop. Otherwise, one or the other is always having to stop by a store to get this or that. We all know “this or that” can quickly add up to blow the budget! One tip here that my husband and I have found helpful is to share a list. We use the Google Keep on our phones because it’s quick way to share a shopping list. It also allows you to speak a voice memo on the go, and it’s just a neat tool to keep a list that helps you get everything you need in one shopping trip. 3- Discuss and determine savings goals. It’s so important to discuss and determine your savings goals. What’s your emergency fund amount that you agree will only be used for absolute emergencies? What’s your short term savings goals? Long term savings goals? Set and agree on terms for how much you will save to meet your goals. Once you have decided how much of your budget will go to savings, automate it! This is a way to make sure you pay yourself first and see your savings grow. As a result, your budget will stay on track and you will be prepared for an emergency expense. For our family, our current savings goal is six months worth of living expenses in addition to the emergency fund. We have automated a certain amount to go toward this goal and will increase it once we’re completely out of debt, which leads to tip #4. 4- Focus on getting out of debt. Getting out of debt is something couples can focus together. It requires knowing how much debt you have and deciding how you want to attack it. Two different methods of getting out of debt are the debt snowball and debt avalanche methods. Debt snowball is paying off your smallest debt first, then moving on to the next in order of least amount to greatest. Debt avalanche method is paying off your debt with the highest interest rate first and then moving on to the next debt in order of highest to lowest interest rate. Once you’ve decided to get out of debt you’ll have to work as a team to avoid using credit cards or chasing shiny objects. Those things will put major roadblocks in your budgeting plans and getting out of debt. If you and your significant other have a big purchase in mind, discuss your timelines and what your options are to avoid loans (outside of a mortgage.) The best way to discuss this in your budget is to prioritize needs vs wants. You may want a new four door Jeep (okay, that’s on my want list) but you just need a reliable used vehicle. A car loan can break your budget and the momentum you’ve had from seeing results. If you can make these purchases part of your savings goals and avoid loans, you will keep more of your money. Loans may have a better interest rate than a credit card, but they still take away from your bottom line instead of adding to it. I brought student loan debt into our marriage. Although we’ve approached the payoff as a team, it has been a huge stumbling block in getting ahead with our budget and savings. My student loans have really controlled a big part of our money instead of the other way around. It’s the only debt we owe (aside from the mortgage) and I can’t wait to pay them off and instantly boost our budget! 6- Make a meal plan together. Making a meal plan together will help when it comes to budgeting for groceries. It makes your shopping easier. It also helps to avoid eating out so much. Meal planning was a struggle in our marriage for a long time because our food preferences are polar opposites. Finally, I just asked my husband to tell me the five or six things that he could eat once a week, every week. Want a peek at our less than exciting meal plan? Doing this saved more than our budget! It simplified what had become stressful meal planning and helps plan the grocery & eating out budget well in advance. 7- Create more experiences instead of buying more stuff. Frugal can still mean fun! There are all kinds of budget friendly fun activities for families! Experiences will always create more meaningful memories than more “stuff.” Skip going out and have a movie night at home. Experiences are things you won’t regret, but a purchase that blows the budget can quickly become a regret! Impulse shopping for things you think you need usually leads to buyer’s remorse. Instead, think about how you can prioritize experiences and have the added benefit of a home less cluttered. Less really can mean more! 8- Plan ahead for the future together. Statistics are showing that 95% of senior citizens can’t afford to retire. That’s very concerning! The way to avoid being one of those stats is to start saving for your future now. What kind of lifestyle do you want for the future and retirement years? Does it involve travel? Are either of you interested in exploring another personal or professional opportunity? It’s important to know what your future goals are so that your current budget includes investment accounts, retirement plans, 401Ks, ROTH IRAs or whatever plan(s) you have chosen to save up for the future. If you have kids or are planning to have kids, that adds a whole new dimension to the budget. It involves discussion and planning for expenses that range all the way from diapers to diplomas! This needs to be included in conversations you have about your budget, lifestyle, and goals as it relates to expenses for a family with one or more child. 9- Share the budget tasks. Even if you automate as much as possible, there are still budget tasks to do such as checking online statements, paying bills that are not automated, and tracking regular expenses. Share the budget tasks and keep the lines of communication open when it comes to finances. This way, one person does not fully manage the finances and you are both clear on the current situation and future goals. Finances are a common source of arguments among couples, but it doesn’t have to be if you approach it as a team with a shared outcome. At some point, a bill is going to be paid late. Someone is going to make a purchase that wasn’t discussed in advance. My husband and I have both had to pay for repairs or replacements from a big “oops” from time to time. Life happens, things happen! In these situations, extend grace to keep your relationship healthy when it comes to finances. The healthy relationship is the best return on investment you’ll ever receive. Hopefully these 10 best budgeting tips for couples gave you some ideas for taking your budget to the next level and achieving your financial goals! If you need to get started on a budget, please check out the 90 Day Budget Workbook. It’s by far my favorite resource for getting started with a budget! Meal planning and grocery lists have really helped me and my wife’s budget. Especially the grocery list part, although it’s often combined with the meal planning. We typically make one big grocery trip a week. I, too, brought student loans into our marriage. We paid off somewhere around $60k to $70k in debt last year and are on a fast track to pay a similar amount this year. It’s great that we’re both on board. Yes, it makes all the difference when you’re both on board! Y’all are doing fantastic with the debt payoff, wow! Thanks for sharing, Joe. Good luck with your financial goals this year. It’s really made our marriage more fun, setting goals and planning for the future. Something to look forward to! 🙂 Thanks for this post! I totally agree that meal planning reduces stress in more ways than one! That’s awesome that you guys are a true team when it comes to your future goals and making sacrifices now so you can achieve those goals. I really appreciate this thoughtful comment, so glad you enjoyed the post!